Based at Ferrymead Heritage Park, the Canterbury Railway Society restores and operates New Zealand’s finest collection of steam, diesel and electric locomotives, rolling stock, signalling equipment and buildings. Want a Fantastic Birthday Option? For the price of a Bouncy Castle you can charter an entire Diesel Railcar for the day! Steam will be F 13 Peveril – New Zealand’s oldest working Steam Loco built in 1872, returned to service 2015. 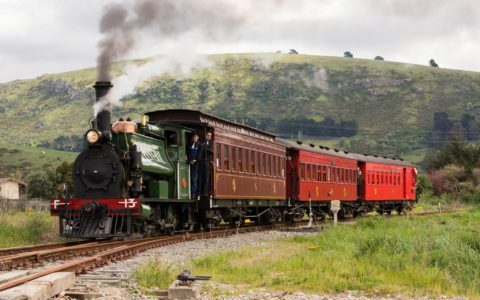 The Ferrymead Railway and the Canterbury Railway Society trace their heritage back to the 1940s when the New Zealand Railway and Locomotive Society was formed. Located in Christchurch, the Society is a non-profit organisation that carries out a range of activities, including the operation of the Ferrymead Railway, the preservation of locomotives and rolling stock, the sale of publications and souvenirs, and the publication of a monthly newsletter for members. The CRS also participates in other local and national rail preservation activities throughout New Zealand. Among this site you’ll find information about our running schedule, our locomotives and equipment, how you can Join the CRS and how to get to Ferrymead Heritage Park. The Ferrymead Railway is a living museum and in our photo gallery you’ll be able to see many pictures of our locomotives, the rolling stock, our heritage train and photos from around our complex including the station houses, signal box, yard, workshops and sheds. This will give you an idea of what you’ll see when you come visit us.